Discover an underground world full of tunnels and mystery in this middle grade adventure from the best-selling, Pulitzer-nominated author of Heroes of the Frontier and What Is the What? When Gran's friend, the difficult-to-impress Catalina Catalan, presses a silver handle into a hillside and opens a doorway to underground, he knows that she is extraordinary and brave and that he will have no choice but to follow her and help her save the town (and the known world). With luck on their side and some discarded hockey sticks for good measure, they might just emerge as heroes. 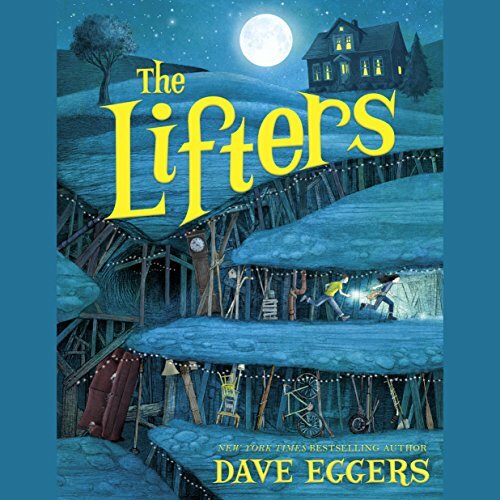 In The Lifters, critically acclaimed author Dave Eggers establishes himself as a storyteller who can entertain and inspire listeners of any age. This middle grade adventure has all the makings of a classic. I had no idea what to expect when I started this book, but as usual, I was gripped from the first chapter and spent my entire Saturday listening. Then I started to get the story of inner earth/ inner dialogue, and I was completely touched and filled with emotion. The lifters are the spiritual warriors of this world who have known sadness, who have known the valleys and peaks and want to share hope and healing with everyone around them. Standing in the storm allowed the community to get beyond it, to stop seeing each other from their differences, and to use something important to all of their common histories to form a bond. What a wonderful message-Thanks Dave! Funny, and a beautiful metaphor. My 8 and 11 year olds loved it. They say they enjoyed the humour and their favourite character was the Duke. And that Catalina Catalan is a superhero name. Many children's stories show the protagonist moving to a new town and finding things aren't as you'd expect. Here we have a great example, with a rather intriguing concept and some memorable characters. Gran (full name Granite Flowerpetal, I kid you not) moves 1000 miles with his family after his father cannot find work. With a mother wheelchair-bound and a father travelling far and wide to find jobs, he and his sister start at a new school in Carousel and begin to notice buildings... sinking. There is an underground world that Gran discovers, alongside a new friend, the also interestingly-named Catalina Catalan. My favourite part of the book though, was the battle between citizens of the town, fighting over Propositions P and S, and M and H (supporting Parks and Schools or providing funds to stop Moose via a Helicopter warning system). Brilliant. An enjoyable story for young readers, an exciting concept from an author known for his adult novels. The narrator of the Audible copy I listened to brought the story to life and it's a voice that worked well for both genders. I wanted more about the Propositions, but overall I liked this fairly brief story. With thanks to Nudge Books for providing a sample reading copy via Audible.